“The blog is looking a bit sparse these days?” This has been the statement of many of my concerned readers recently, in response to my blogging hiatus. I can only apologise; I don’t really have a legitimate reason for the break, I’ve just been adjusting to life and finding my feet again after the summer! Thank you all for your emails and messages anyway – I’ll try to keep on top of things! It might be tough though, third year has started and we’ve all moved back on campus to be “closer to the library…” Blogging in halls kitchens is about 10x more difficult than blogging at home! But honestly, I’ll try! I still bake pretty often, which is good because it means that when I do finally get round to blogging the recipes, they will be finessed to perfection (erm, hopefully). It seems I was clutching on to the last straws of summer with this light and flavourful cake, but it was decadent enough for autumn and the greek yoghurt lends a fudgy texture to the sponge. 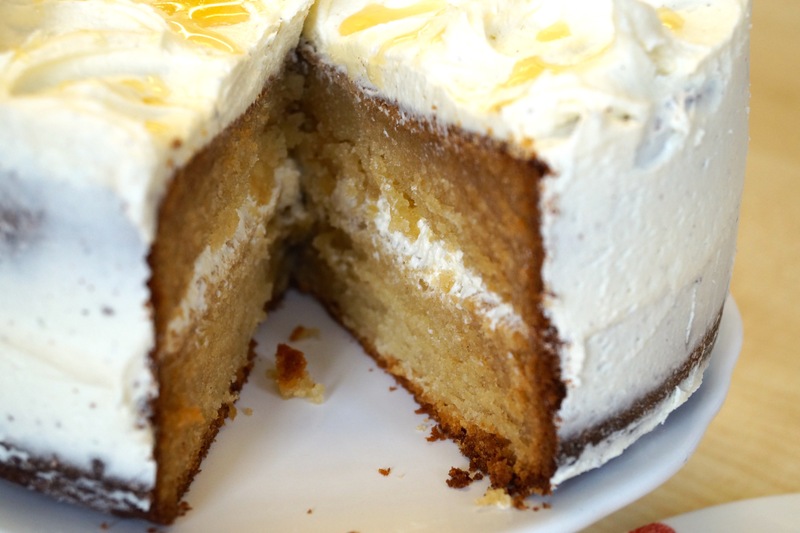 I love baking with greek yoghurt so much – cakes are never too sweet and they are always really moist! 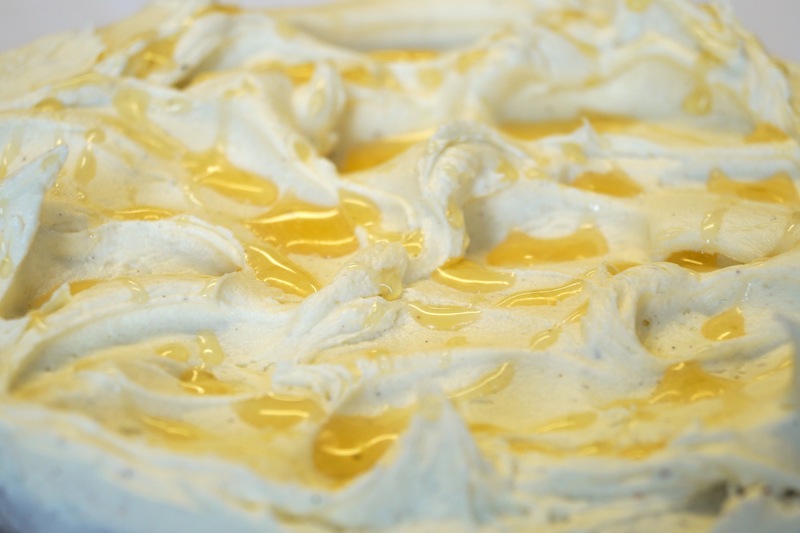 Greek yoghurt and honey is a classic combo and shouldn’t really be messed with, so I didn’t even try! 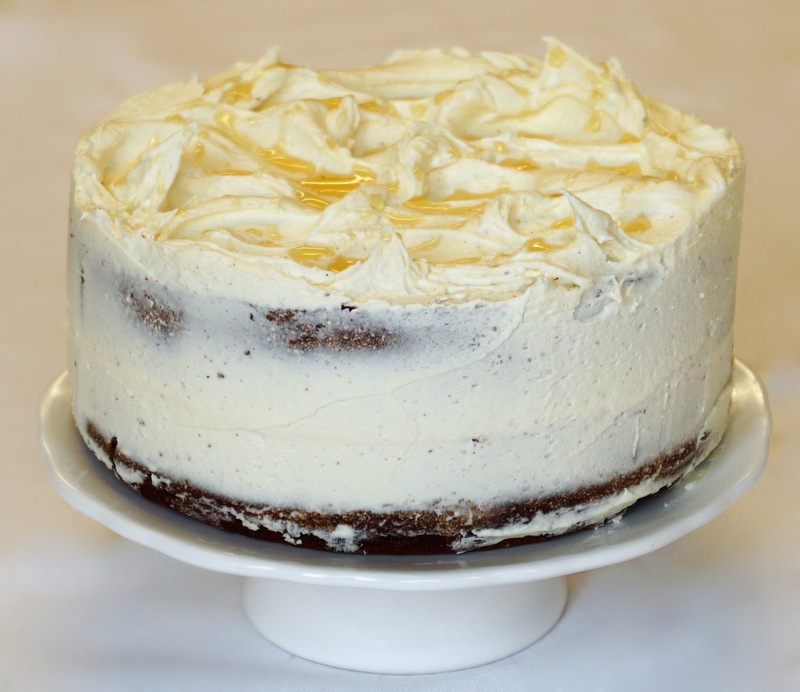 The frosting is extremely light and buttery, flavoured with vanilla seeds and honey. It complemented the cake well. Topping this cake with fresh figs or berries would be delightful, but unfortunately I didn’t have any to hand. 1) Heat the oven to 160 FAN. Grease and line a 7 or 8” tin with baking parchment and set aside. 2) Beat the butter and sugars until light and fluffy – for about 5 minutes. 3) Add the eggs one at a time, beating after each addition and then add the vanilla extract. 4) In a separate bowl, whisk the flour, bicarb and baking powder together and get rid of any lumps. 5) Stir the honey through the greek yoghurt and add the flour mixture and yoghurt mixture to the egg mixture alternately, beginning and ending with the flour mixture. 6) Once combined, pour in to prepared tin and bake for 35-40 minutes. Depending on the size of your tin, it could take up to an hour to get cooked through from the middle. Check it regularly with a cake tester or skewer, once baked it should come out clean. 7) To make the frosting, beat the butter on high speed for about 8 minutes. It will go pale in colour and have a whipped consistency. Add the icing sugar a few spoons at a time until stiff. 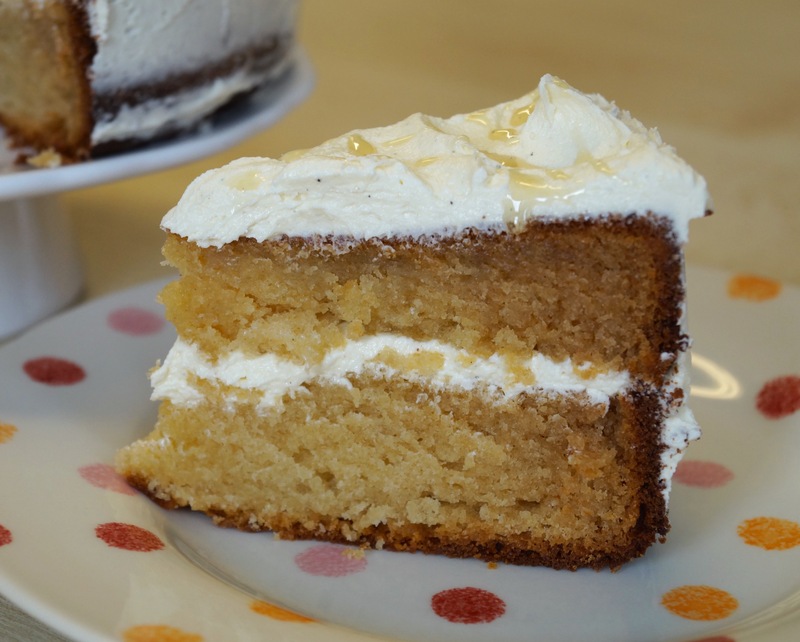 You may need more or less icing sugar to reach the desired frosting stiffness. Add the honey and the vanilla to the frosting. If your frosting is too thick, thin it with a tablespoon or so of milk. 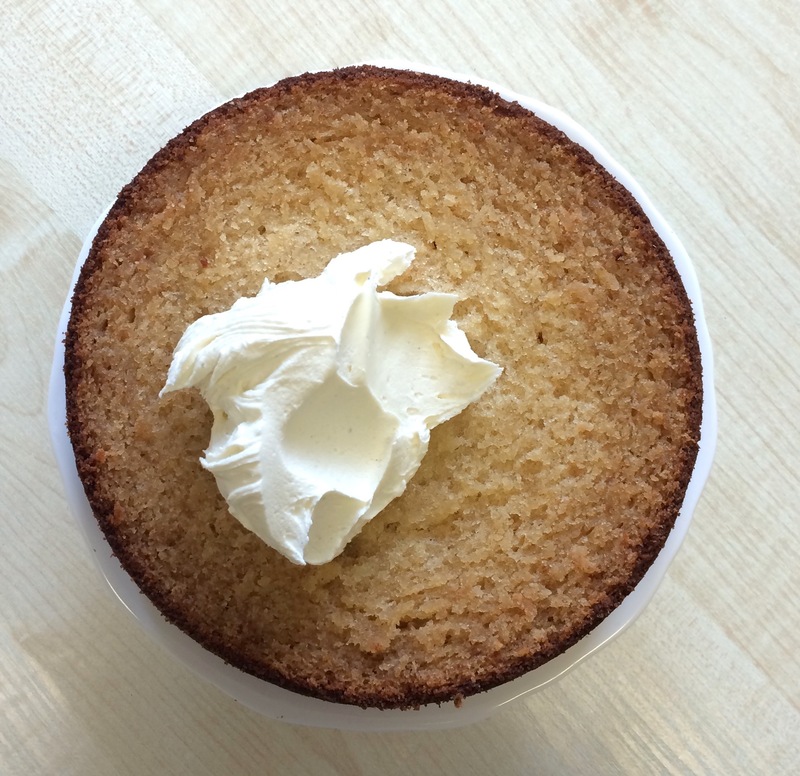 Cut the cooled cake in half evenly and spread a large dollop of frosting over it. Add the second layer and cover the entire cake with the remaining frosting. Drizzle honey over the top of the cake and serve. This cake keeps well for 2-3 days in the fridge. Thank you! It’s definitely difficult! Lol, I will make it for you soon!